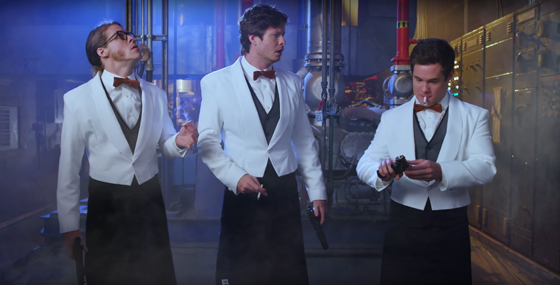 Workaholics completed its seven-season run on TV earlier this year, leaving cast members and co-creators Anders Holm, Adam Devine and Blake Henderson more time to work on their Seth Rogen-produced action comedy Game Over, Man! Now, the first look at the Netflix movie has arrived. While the teaser doesn't reveal too much about the film, a Netflix page notes that "three friends are on the verge of getting their videogame financed when their benefactor is taken hostage by terrorists." Last year, the project had been described to The Hollywood Reporter as "Die Hard in a hotel." The film won't arrive on Netflix for a while yet — its release date is slated for April 20, 2018. The film is directed by Kyle Newcheck and produced by Scott Rudin and Eli Bush of Scott Rudin Productions, Seth Rogen, Evan Goldberg and James Weaver of Point Grey. Holm, Devine and Henderson also serve as producers. Watch the teaser trailer for Game Over, Man! in the player below.